Now, new PayAnywhere merchants can save time on employment management with our new time clock and scheduling features. Our latest version integrates with Homebase, which helps thousands of businesses across the U.S. streamline workforce management via cloud-based software tools. New PayAnywhere merchants can use the time clock functionality within the PayAnywhere app. (Note: Existing PayAnywhere merchants will receive this feature soon!) 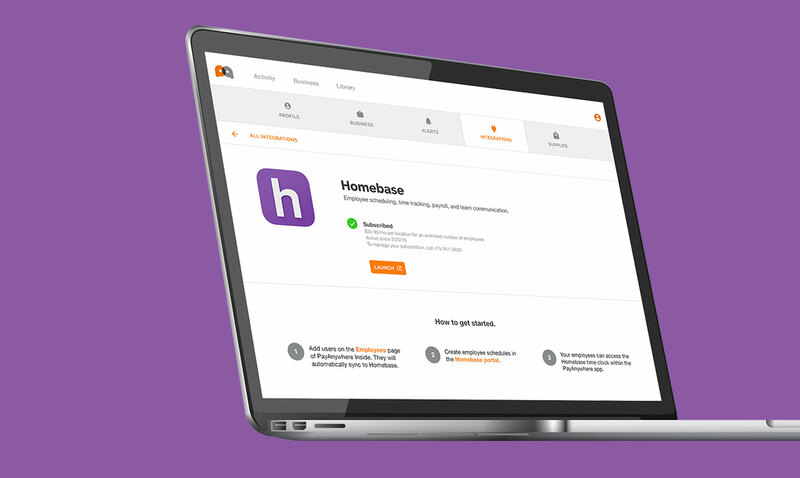 In addition, through the PayAnywhere Inside portal, you’ll get a free, 30-day trial of HomeBase Plus, which offers even more advanced employee management and reporting capabilities. Log in to PayAnywhere Inside. Add your employees in Business → Employees. Create a password in Homebase to start your free trial. You’ll now be able to use the PayAnywhere app for time clock functionality. You can also manage employee schedules through Homebase. Look for emails from Homebase for help with full employee management capabilities. At the end of the free trial, you’ll be able to opt in to continued use of Homebase Plus or other plans including Homebase Essentials or Homebase Enterprise. If you don’t select one of these options after the trial period, we’ll automatically enroll you in the free Homebase Basic plan, which includes the time clock and basic scheduling capabilities. For more information on how to get started using the time clock and the free, 30-day Homebase Plus trial, please see our PayAnywhere and Homebase - Quick Start Guide.